I love wandering along the Bassin des Chalutiers in La Rochelle. Not only is this lovely port city full of history but so, in a modern sense, are the old docks. You nearly always find a handful of famous yachts still modestly going about their work. As I wandered along the pontoons devoted to the Velux 5 Oceans entries (more on that tomorrow), my eye was caught by these notables. The boat above, as you are possibly well aware, is Bernard Moitissier’s famous steel ketch Joshua. She’s still looking good. The boat below is Jean-Luc Van Den Heedes’s sturdy, speedy 85ft aluminium cutter, Adrien. He broke the solo, non-stop westabout record – the ‘wrong way’ record in 2000, and his time of 122 days still stands. 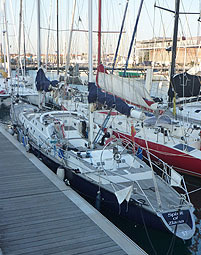 The photo below again is of another of VDH’s world-girdling yachts, moored up in a sort of ‘design eras’ raft. His Open 60 yawl in the middle of the raft of three was so narrow it earned the nickname ‘the red cigar’. 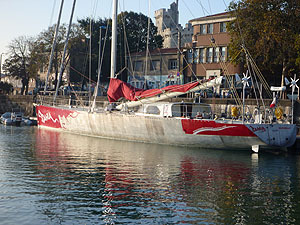 VDH built her for and raced in the 1992/3 Vendée Globe as Groupe Sofap-Helvim. On the inside of the raft is an 88ft cruising yacht called Spirit of Ziana, also with an extremely narrow beam for her length and a period piece pinched-in transom. She looks so slender in modern terms that if you squint a little you could think you were looking at one half of a catamaran. All I know about Spirit of Ziana is that she is used for charter. Why is she ringing a bell? Do you know what she was or did when she was a nipper? And finally the big, wide, modern racing yacht you can glimpse on the outside of the raft is Swiss solo sailor Dominique Wavre’s modern Owen Clarke-designed IMOCA 60, now named Mirabaud. 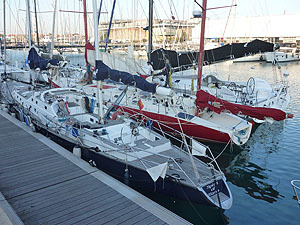 Dominique and his wife Michèle Paret will be doing the Barcelona World Race in December.